^ 1.0 1.1 Daft Punk - Biography. iTunes. [2013-04-25] （英语）. ^ Daft Punk. DJZ.com. [2013-04-25]. （原始内容存档于2013-01-20） （英语）. ^ 3.0 3.1 Bernadette McNulty. Daft Punk: Behind the robot masks. 每日電訊報. 2007-11-17 [2013-04-25] （英语）. ^ 4.0 4.1 Sean Cooper. Daft Punk. Allmusic. [2013-04-25] （英语）. ^ 6.0 6.1 6.2 6.3 Darlin'. Discogs. [2013-04-25] （英语）. ^ 傻瓜龐克 / 迪斯可銀河大作戰. 博客來. [2013-04-25]. （原始内容存档于2013-09-21）. ^ Daft Punk to release studio album after signing deal with Columbia. 衛報. 2013-01-28 [2013-04-25] （英语）. ^ Amy Phillips、Evan Minsker. Daft Punk's New Album is Called Random Access Memories, Out May 21, Listed on iTunes. Pitchfork Media. 2013-03-23 [2013-04-25] （英语）. ^ 10.0 10.1 Shimmies In Super 8. Discogs. [2013-04-26] （英语）. ^ Yahoo! Music – Interviews. 雅虎音樂. 2010-12-30 [2011-01-03]. （原始内容存档于2007-08-09）. ^ Critic Reviews for Human After All. Metacritic. [2013-04-28] （英语）. ^ Leslie Felperin. Daft Punk's Electroma. 綜藝. 2006-05-23 [2013-05-01] （英语）. ^ Le film des Daft Punk projeté tous les samedis à Paris. AlloCiné（英语：AlloCiné）. 2007-03-23 [2013-05-01] （法语）. ^ Exclusive: Daft Punk Unveil Live Album. Spin (雜誌). 2007-08-24 [2013-05-01] （英语）. ^ Jonathan Cohen. Exclusive: Live Album To Chronicle Daft Punk Tour. 告示牌. 2007-08-14 [2013-05-01] （英语）. ^ Edward Douglas. SDCC: Comic-Con: Disney 3D Hits Hall H!. ComingSoon.net. 2009-07-23 [2013-05-02] （英语）. ^ Debbie Tharp. Soundtrack Review: Daft Punk’s Classical Meets Cyberpunk Approach to “Tron: Legacy”. CultureMob. 2010-11-23 [2013-05-02]. （原始内容存档于2013-06-14） （英语）. ^ 'Tron Legacy' Panel Report, Fresh From San Diego Comic-Con. MTV. 2009-07-23 [2013-05-02]. （原始内容存档于2013-09-21） （英语）. ^ Daft Punk's 'Derezzed' Music Video Premieres. MTV. [2013-05-02] （英语）. ^ Disney TRON: LEGACY Hits The Grid. 美通社. 2011-02-11 [2013-05-02] （英语）. ^ Laure Narlian. Daft Punk chevaliers des Arts et des Lettres !. 法國電視二台. 2010-08-24 [2013-05-02] （法语）. ^ Top 100 DJs. DJ雜誌. [2013-05-02]. （原始内容存档于2013-10-26） （英语）. ^ MIXMAG'S GREATEST DANCE ACT OF ALL TIME REVEALED. Mixmag（英语：Mixmag）. 2012-01-19 [2013-05-02]. （原始内容存档于2012-01-21） （英语）. ^ Carrie Battan, Amy Phillips. Listen: Lost Daft Punk Track "Drive". Pitchfork. 2011-09-16 [2013-05-02] （英语）. ^ Paul Williams on Hit Records Nightlife Video hosted by Eddie Muentes. YouTube. 2010-07-14 [2013-05-02]. ^ Tyler Rudick. Disco legend Nile Rodgers talks about cancer, Broadway & his Daft Punk connection. CultureMap. 2012-02-06 [2013-05-02] （英语）. ^ Tom mann. "Chic". FasterLouder.au. 2012-03-03 [2013-05-02]. （原始内容存档于2012年3月8日） （英语）. ^ Robin Murray. Daft Punk Working With Paul Williams. Clash雜誌. 2012-03-16 [2013-05-02] （英语）. ^ Jenn Pelly. Daft Punk Album Not Coming in June. Pitchfork. 2012-03-19 [2013-05-02] （英语）. ^ Field Day Radio | Field Day Festival. Fielddayfestivals.com. [2013-05-02]. （原始内容存档于2013-01-28） （英语）. ^ Daft Punk unveil new blues mix – listen. 新音樂快遞. 2012-10-11 [2013-05-02] （英语）. ^ Top 100 DJs. DJ雜誌. [2013-05-02]. （原始内容存档于2013-08-06） （英语）. ^ James Wood. Interview: Bassist Nathan East Discusses Fourplay's New Album and His Days with Eric Clapton. Guitar World. 2012-11-29 [2013-05-02]. （原始内容存档于2012-12-04） （英语）. ^ Daft Punk arrive chez Sony. Le Parisien. 2013-01-26 [2013-05-02]. （原始内容存档于2016-08-11） （法语）. ^ Daft Punk to release studio album after signing deal with Columbia. 衛報. 2013-01-28 [2013-05-02] （英语）. ^ Amy Phillips, Laura Snapes. Daft Punk Confirm Alliance With Columbia. Pitchfork. 2013-02-26 [2013-05-02]. （原始内容存档于2013-05-01） （英语）. ^ Amy Phillips. Watch: Daft Punk Air Mysterious Advertisement During "Saturday Night Live". Pitchfork. 2013-03-02 [2013-05-02]. （原始内容存档于2013-04-30） （英语）. ^ "Random Access Memories". iTunes Store. 2013-03-23 [2013-05-02]. ^ Jordan Kinley, Kathleen Flood. The Vision Behind the Lens: An Exclusive Interview with Cinematographer Ed Lachman. Vice. 2013-04-03 [2013-05-02] （英语）. ^ Kathy McCabe. Daft Punk to launch new record in ... Wee Waa. 先驅太陽報（英语：Herald Sun）. 2013-04-09 [2013-05-02] （英语）. ^ Amy Phillips. Daft Punk Confirm Julian Casablancas, Panda Bear, Pharrell, More Collaborations With Coachella Video. Pitchfork. 2013-04-12 [2013-05-02] （英语）. ^ James Montgomery. Daft Punk's 'Get Lucky' Gets Very Specific Release Date. MTV. 2013-04-18 [2013-05-02] （英语）. ^ Daft Punk top singles chart while Sande sets album record. BBC. 2013-04-28 [2013-05-02] （英语）. ^ 46.0 46.1 Keith Caulfield. Daft Punk Scores Second Week at No. 1 on Billboard 200 Chart. 告示牌. 2013-06-05 [2013-06-22] （英语）. ^ Reggie Ugwu. Kanye West Playlist: Recommended If You Like 'Yeezus'. 告示牌. 2013-06-17 [2013-06-22] （英语）. ^ 48.0 48.1 48.2 48.3 48.4 48.5 48.6 48.7 48.8 Daft Punk. Techno.de. [2013-05-02] （英语）. ^ Bryan Reesman. DAFT PUNK. MIXonline. 2001-10-01 [2013-05-05]. （原始内容存档于2014-11-10） （英语）. ^ Scott Indrisek. Daft Punk: One half of Daft Punk, Thomas Bangalter, dishes on mixing high and low-brow culture with performance art.. Whitewall Magazine. 2009: 90–99 [2013-05-05]. （原始内容 (SWF as HTML)存档于2013-07-31） （英语）. ^ Randy Lewis. Daft Punk's ‘Legacy' act. 洛杉磯時報. 2010-12-06 [2013-05-05] （英语）. ^ Daft Punk tell all about Tron: Legacy. FACT雜誌. 2010-11-18 [2013-05-05] （英语）. ^ Daft Punk | Random Access Memories | The Collaborators: Todd Edwards. YouTube. 2013-04-08 [2013-05-05]. ^ Daft Punk interview in Japan (1/2). YouTube. 2006-06-09 [2013-05-17]. ^ Keiran Grant. Who are those masked men?. Canoe.ca. 1997-04-12 [2013-05-17]. （原始内容存档于2012-06-29） （英语）. ^ 56.0 56.1 Jonathan Durbin. Daft Punk and the Rise of the New Parisian Nightlife. PAPER雜誌. 2013-05-15 [2013-05-17] （英语）. ^ Daft Punk, live at Even Furthur 1996. driftglass.org. 2008-03-15 [2013-05-17]. （原始内容存档于2008-12-22） （英语）. ^ Alice Hutchison. 2 CENTS: KRAFTWERK. physicsroom.org.nz. 1997-05-25 [2013-05-18] （英语）. ^ Merry Swankster. Coachella Spotlight Review: Daft Punk - 4.29.2006. MerrySwankster.com. 2006-05-05 [2013-05-18]. （原始内容存档于2006-06-28） （英语）. ^ Spencer Patterson. Chatting with a robot. Las Vegas Weekly. 2007-10-25 [2013-05-18] （英语）. ^ 61.0 61.1 61.2 61.3 Daft Punk. MySpace. [2013-05-18]. ^ Wireless Festival review. 泰晤士報. [2013-05-18] （英语）. ^ Jon Fletcher. Unstoppable Kaisers rise to the occasion. ThisisLondon. 2007-07-18 [2013-05-18]. （原始内容存档于2013-09-21） （英语）. ^ Daft Punk close Oxegen with robotic spectacular. 新音樂快遞. 2007-07-09 [2013-05-18] （英语）. ^ Daft Punk. Traffic Festival. [2013-05-18]. （原始内容存档于2008-05-09） （英语）. ^ Scott Plagenhoef. Lollapalooza Report: Friday [Scott Plagenhoef]. Pitchfork. 2007-08-04 [2013-05-18]. （原始内容存档于2007-12-13） （英语）. ^ B. Van Isacker. Daft Punk announce double live album. Side-Line. 2007-08-31 [2013-05-18] （英语）. ^ Louis Vuitton Fashion Show. 路易威登. 2010-10-07 [2013-05-18]. （原始内容存档于2013-09-21） （英语）. ^ Jorge Varela. Revisión: Daft Punk Ciudad de México. vivirmexico.com. 2011-11-01 [2013-05-18] （西班牙语）. ^ Angus Paterson. Daft Punk ARE coming to Australia! Presented by Michael Coppel & Modular, supported by inthemix!. inthemix. 哥倫比亞唱片. 2007-08-30 [2013-05-18] （英语）. ^ Daft Punk to play last shows in Australia. 澳洲廣播公司. 2007-09-21 [2013-05-18] （英语）. ^ Technology cannot be trusted. TheDaftClub.com. 2007-11-28 [2013-05-18]. （原始内容存档于2008-02-21） （英语）. ^ Daft Punk make surprise Grammy appearance with Kanye West. 新音樂快遞. 2008-02-11 [2013-05-18]. （原始内容存档于2016-04-02） （英语）. ^ Daft Punk rock the Grammy Awards with 4 Lemurs. JazzMutant. 2008-02-10 [2013-05-18]. （原始内容存档于2016-10-12） （英语）. ^ Grammys Arrivals - Part One. 綜藝. 2008-02-09 [2013-05-18]. （原始内容存档于2008-12-19） （英语）. ^ Tom Breihan. Daft Punk Not Playing in China This Weekend. Pitchfork. 2009-02-09 [2013-05-18]. （原始内容存档于2009-02-13） （英语）. ^ Yao Minji. Music fans punked by faux show scamsters. 上海日報. 2009-02-11 [2013-05-18]. （原始内容存档于2009-03-17） （英语）. ^ 79.0 79.1 Daft Alive. EMI. [2013-05-19] （英语）. ^ Christine Borges. 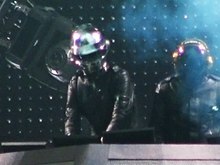 Daft Punk to Tour in 2011/2012; Will Make Several In-Person Appearances for Tron. 邁阿密新時報（英语：Miami New Times）. 2010-09-08 [2013-05-18] （英语）. ^ Daft Punk played w/ Phoenix @ Madison Square Garden (pics). Brooklynvegan.com. 2010-10-20 [2013-05-18] （英语）. ^ Daft punk Gap commerical. YouTube. 2005-11-20 [2013-05-19]. ^ Daft Punk Commercial. Toonami. [2013-05-19] （英语）. ^ Jonathan Cohen. Exclusive: Live Album To Chronicle Daft Punk Tour. 告示牌. 2007-08-14 [2013-05-19] （英语）. ^ Janet Jackson Samples Daft Punk. Stereogum（英语：Stereogum）. 2008-02-21 [2013-05-19]. （原始内容存档于2008-02-25） （英语）. ^ Grime music cleans up in the charts. 獨立報. 2008-08-08 [2013-05-19] （英语）. ^ [Review/Listen] – The Fall – Your Future Our Clutter (2010). ListenBeforeYouBuy.net. 2010-03-18 [2013-05-19] （英语）. ^ Tom Breihan. Daft Punk Produce New N.E.R.D. Track. Pitchfork. 2010-09-29 [2013-05-22] （英语）. ^ discostu.png. Photobucket. [2013-05-22] （英语）. ^ Meg Drewett. Daft Punk join up with Lotus F1 Team at Monaco Grand Prix - pictures. Digital Spy. 2013-05-27 [2013-06-22] （英语）. ^ Robbie Daw. Daft Punk Attend Grand Prix To Support The Lotus F1 Team, Who Do Not Get Lucky In The Race. Idolator. 2013-05-28 [2013-06-22] （英语）.